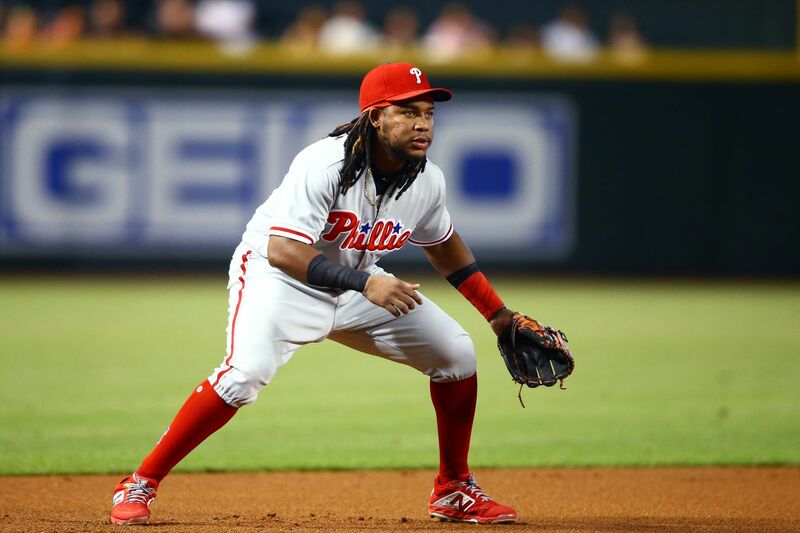 The Phillies could be looking to find homes for a number of their own players. Here are five trades that make sense. The Phillies are widely expected to add some high-end talent to their roster in the coming weeks, but you can’t simply add players without moving others out of the way. General manager Matt Klentak undoubtedly knows this, as rumors swirled this week that the Phils are open and/or looking to move Carlos Santana, Cesar Hernandez and Maikel Franco. All three players are key members of the team’s core, although all three are players who could be replaced by other Phillies players or by new players entering the organization. You can also add Justin Bour to the mix of players possibly on their way out, as well as outfielders Odubel Herrera and Nick Williams, and starting pitcher Zach Eflin. So here are four trades the Phillies could make in order to deal away their own players that make sense to me. Note: not all of these trades should happen, but are trades that, independent of each other, would be good ideas. Franco had his best season since 2015 but it seems clear the third baseman is on his way out the door. NBC Sports’ Jim Salisbury reported there is a deal to be made with San Diego for the 26-year-old who batted .270/.314/.467 in 131 games last season, with 22 home runs and 68 RBIs. However, while his 1.2 fWAR was better than the -0.4 he put up in 2017, it was still the second-lowest of his career and not terribly impressive. However, there is the hope that, at just 26, there is room for growth. In exchange, the Phillies should ask for young starting pitcher Jacob Nix, who is the No. 14 prospect in the Padres’ system, according to MLB.com. After making nine starts in AA last year, with a 2.05 ERA and 7.01 K/9, he made nine starts for the Padres and had a 7.02 ERA and a 5.83 FIP. MLB.com says he can reach 97 with his fastball with a plus-curveball and good control. But while he avoids issuing walks, he also doesn’t miss a ton of bats. If he can develop his changeup and get some more swings and misses, he could be a No. 3-type starter. Salisbury also has reported the team is open to dealing Carlos Santana, although they don’t want to eat too much of his salary because they don’t want it to look like the signing of Santana was a mistake (Phillies, if this is true, get over yourselves). Santana had a mostly typical Santana season last year, however, as Salisbury reported, the Phils would like to move Hoskins to first base full-time, so either trading Santana or moving him to third base would be the best way to do that. If they decide to deal him, a suitor could emerge in the Yankees, who one would think has grown weary of riding the Greg Bird roller coaster year after year. New York, meanwhile, is looking to trade Sonny Gray, who simply did not fit in The Big Apple. While he had a 4.90 ERA and a 4.17 FIP last year, he actually had a 3.17 ERA on the road and 6.98 at Yankee Stadium. His strikeout rate of 21.1% is right in line with his career average, although his 9.8% walk rate was a bit higher than his career mark of 8.2%. He gave up a lot of hits last year, but actually kept the ball in the park, and there are likely a number of teams that could be interested in the 29-year-old right-hander, so if the Phils had to throw in a mid-level prospect, I wouldn’t hate it. The Phillies really should play Scott Kingery at second base full time. While he improved at shortstop last year, becoming a fine replacement-level player there defensively, his is a plus-defender at second. Unfortunately, Cesar Hernandez currently mans that position. A trade of Cesar should be a main goal of this off-season. There are a number of good free agent second basemen on the market, so a Hernandez trade may not be easy to complete. But if Matt Klentak can combine Hernandez with a young pitcher with potential like Eflin in exchange for a good defensive outfielder with offensive upside like Ramon Laureano, plus a relief pitcher like Lou Trevino, that would be a coup for the Phillies. Remember, Laureano is the guy who did this last season. Now, this deal doesn’t make much sense if you make a deal for Laureano. Instead, this would be an alternate way of improving center field for the next few years. Herrera obviously has a ton of talent, but he took a big step back last year and, once Roman Quinn ascended to the Majors, was relegated to playing the corner outfield spots. He slumped for the last four months of the year and questions about his effort and attitude did not wane in 2018. The Phils have no use for Bour next year, and while trading Neshek would hurt a bit, but he can likely be replaced. The goal would be to land Kiermaier, who has missed a lot of time due to injuries over the last few years. Last season he appeared in only 88 games after injuring his right thumb on a slide into second base in April. He didn’t return until June 19. Then, at the end of the season, he fractured a bone in his foot after being hit by a pitch. There is only one season in which he has appeared in more than 110 games, and that was in 2015, when he suited up for 151. But when he’s out there, Kiermaier one of the greatest defenders in baseball, and he brings above average offense and stolen bases with him as well. He’s also under team control on a great contract, owed just $54.5 million over the next five years, taking him through his age-33 season.